Gel coating is usually polyester resin that formulated to give a protective layer of waterproof color coat. Its main function is to protect the subsequent layer from defects. Some gelcoating resin is colored while it also available in original clear form, and pigment can be added according to users need. The composite work is started with the preparation of the mould . The mould shall first be cleaned, followed by polishing that normally end up with shiny surface. The suitable wax is then applied to the mold surface that will help to release the finished component when cured. The wax usually applied between two to three times before the application of gel coat. 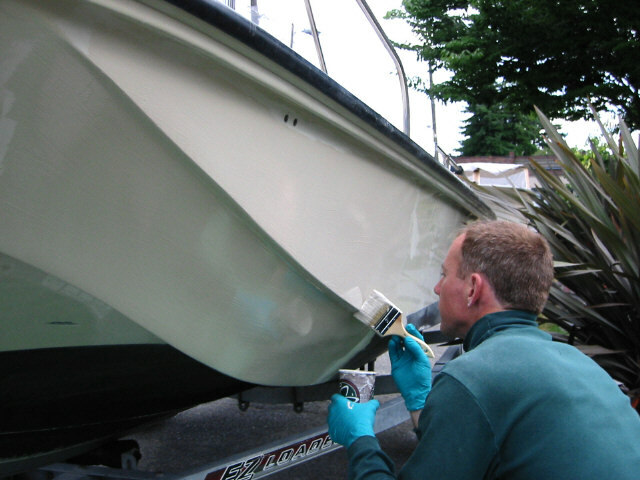 When the release agent is completely dry, the gelcoat is applied by brush or spray. When choosing brush, a wide brush with long soft hairs is preferred. Two coats are generally necessary to prevent brush marks from showing. The second coat being applied once the first has sufficiently cured . Gel coat is applied to about 0.3-0.5mm (Thickness vary manufacturer to manufacturer and from user to user) one to two layers. The operator must ensure the coat in total contact with the contour before starting the lay-up. Gel time of the gelcoat in bulk should preferably be about 15 minutes. The condition of the gelcoat can be determined by touching it, once it feel tacky and not easily removed by finger, the next coat resin system is ready. In some cases, surfacing tissue may be used to reinforce the gelcoat. After the tackiness has been achieved, the first layer of reinforcement (fibre) and impregnation of resin can be start. 2. Please refer to the Materal Data Sheet to determined the ratio of catalyst that will be mix with gelcoat / resin.